From the sculpting table of Linda Lee Sutton to the covers of magazines, reviews in international periodicals, to museums and collectors homes this award winning doll maker believes her talent is a gift from God, to always be appreciated and to be never taken for granted. 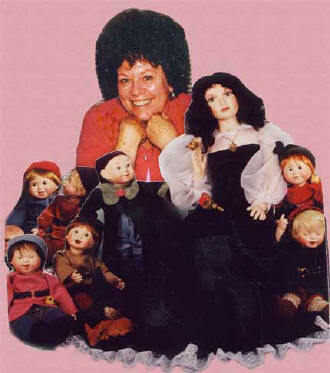 Linda is a professional, experienced porcelain doll maker with over 20 years experience in the doll making industry. Linda artfully makes each individual doll in her studio in a serene Oregon country setting. The artist states that even if you lived on a high mountain you could make dolls if UPS would come. Her attention to detail and exuberance for life is evident in her doll and flower pot designs. Linda was born and raised in Oregon's Rogue River Valley. Linda has memories of her father sitting on the back porch carving animals from soap, while she picked up the shavings to wash her hand made doll clothes. From the first moment her hands touched the clay she felt a connection to it that is indescribable. She realized that this is what she wanted to do and, she now knew that she'd been given a gift and she was going to use it. Jonathan Clark (1695-1734) a 6th Great Grandfather of Linda and grandfather to William Clark of the Lewis and Clark Expedition, makes Linda feel proud that she has a family connection to the founding father who opened up the Northwest making it possible for her to live in this glorious place. This heritage makes her very interested in Native American Indian Designs.